This chapter compares the impact of political constraints on economic policy environments across the cases covered in the preceding chapters. Then, it compares the impact of the policy environment on the degree of coordinative institutions. I hypothesized that stable, broadly targeted policy environments would facilitate the development of coordinative economic governance institutions because, without the risks produced by radical policy change or the allure of particularistic policy benefits, actors would seek to reduce transaction costs by investing in co-specific assets. Conversely, I expected particularistic policy environments to result in hierarchical economic governance institutions. Yeung, H. W. (n.d.). 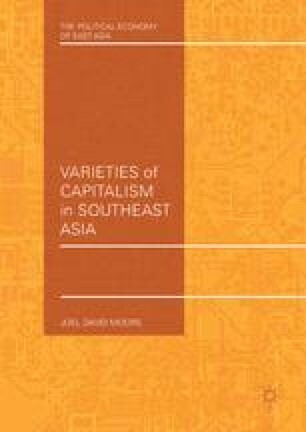 Change and continuity in Southeast Asian Ethnic Chinese business. http://doi.org/10.1007/s10490-006-9007-2.